Ex-Senate President David Mark is expected to return to EFCC office today to answer questions regarding a whopping N5.4billion slush cash and campaign funds traced to him. Part of the money is N550 million, which is part of the $2.1billion controversial arms procurement cash, according to Economic and Financial Crimes Commission (EFCC) sources. Mark is also expected to respond to issues raised in the Panama Papers bordering on his relationship with some shell firms. 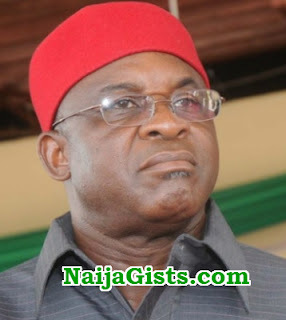 But Mark insisted yesterday that no 2015 presidential election campaign fund for Benue State was given to him. EFCC Detectives will today grill Mark on four issues. He reportedly requested to be allowed to travel home to Otukpo, Benue State, after his preliminary grilling at the EFCC on Thursday, to fetch documents to exonerate himself from the allegations. N550m arms procurement cash; N2.9billion curious payment into National Assembly’s account, which was shared to Senators during his tenure; and his role in the N2billion campaign funds meant for Benue State. This Buhari administration are mainly after those outside the hausa/fulani clan who they feel are threat in unseating them if ever there will be an election in 2019. Nigeria was not, is not and will never be one. you nigerian you get too much problem ,if you arrest yoruba you we say because is not hausa if arrest igbo you go say because is not yoruba. Old fools everywhere. The moment there’s no more PDP and APC, then the country will move positively to the next level. Mon, I totally agree with your point of view. Your comment is 100% correct. A thief is a thief, irrespective of their tribe or political affiliation. At least the Buhari administration is holding some people accountable. When the other party is in power, they can arrest whomsoever they find liable to Nigeria for embezzlement of public funds. So long as our stolen wealth is being returned and applied towards alleviation of the suffering masses to whom the national cake rightly belongs, I don’t care who is being arrested or punished. We only view things from a tribal, political or religious points of view. Until we tune our mentality towards seeing ourselves as Nigerians first, nothing will work in our favor. What a sick country! Can anyone satisfy Nigerians? Fifelomo on Struggling To Stay Motivated? Don’t Give Up Now. You Were Born For This! Karla on Kudirat Afolabi Picture: The Nigerian Widow Beheaded In Saudi Arabia For Drug Trafficking Revealed!